For about four years sensei Shimabuku was privileged to study karate in the dojo of his uncle each day after completing the most menial domestic chores. Having achieved a certain degree of skill in Shuri-Te karate. Master Shimabuku went on to formal training in Kobayashi-Ryu. He met Chotoku Kiyan, who was already famous throughout Okinawa and became one of that master's leading pupils. He also studied with Chojun Miyagi and became his best student. Sensei did not feel he was old or experienced enough to be considered one of the greats at this time. He again took up Kobayashi-Ryu, this time under Choki Motobu, who was virtually a legend in Okinawa. At a large martial arts festival in the village of Fatima, Sensei Shimabuku finally blossomed. He won recognition through a very fine performance of the katas. Shimabuku went on to study the art of the Bo and the Sai as well as the Tee-Faa. His instructors, Taira Shinken and Yabiku Moden were responsible for providing Okinawa's instructors with these particular skills. Shimabuku's reputation throughout Okinawa had reached its peak when World War II struck the island. A business man, as well as a karate teacher, Sensei's small manufacturing plant was completely demolished and he was bankrupt almost from the war's onset. He did his best to avoid conscription into the Japanese Army by escaping to the countryside where he worked as a farmer. As the situation grew more and more desperate for the Japanese and as the need to press the Okinawans into service became urgent, he was forced to flee. As his reputation in karate spread among the Japanese, many soldiers began a thorough search as they wanted to study karate under him. The officers who finally caught up with him agreed to keep the secret of his whereabouts private if he would teach them karate; it was in this manner that Shimabuku survived the war. After the war, his business ruined and little chance of earning a living teaching karate on the war-ravaged island, Master Shimabuku returned to farming and practiced karate privately for his own spiritual repose and physical exercise. 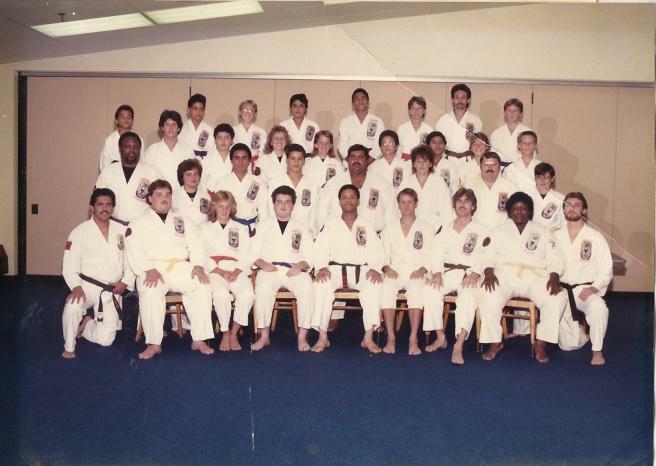 Throughout Okinawa, he was recognized as the island's leading practitioner of both Shorin-Ryu and Gojo-Ryu Karate. In the early nineteen fifties, Master Shimabuku began to consider the idea of combining the various styles into one standard system. He could foresee the problems that were developing out of the difference among styles; he sagely concluded that the unification or the synthesis of styles would enhance the growth of karate. He consulted with the aged masters on the island, and with the heads of the leading schools. At first there was general agreement, but later his idea met resistance as the leaders of the various schools began to fear loss of identity and position. Sensei Shimabuku decided to go ahead on his own; thus in 1954 Isshinryu was born. In developing Isshinryu Karate, Master Shimabuku combined what he felt to be the best elements of Goju-Ryu and Shorin-Ryu, taking advantage also of the profound knowledge of Gung-Fu that he had acquired over the years. The basic katas are derived from Shorin-Ryu and are common to most other styles of Okinawa Karate. Most of the hand and foot kata are named after great Chinese Karate Masters. I come to you with only "Karate"; empty hands. Isshinryu (One Heart Method) was developed by Sensei Shimabuku, Okinawa's Grand Master of Shorin-Ryu, who devoted his life to the study of Karate. He was a Master of Goju-Ryu; studied Kobayshi-Ryu under famous Chotoku Kiyan and later under legendary Choki Motobu. He then studies the art of Bo and Sai weapons defense and Tee-faa under Okinawa's most noted instructors. Master Shimabuku combined the best of these styles into Isshinryu, which epitomizes the powerful, lightning-fast techniques that in ancient times enabled the weaponless Okinawans to defeat the sword-wielding Samurai warrior of Japan. 1. Isshinryu kicks and punches are through from natural stances eliminating wasted motions and giving you split-second advantages over opponents using other styles. 2. Isshinryu stresses proficiency with both hands and foot techniques, making it the most versatile form of Karate because you have no weak points. 3. Isshinryu is the most realistic style of Karate, stressing "close in" techniques necessary for "street-fighting" where you haven't time for elaborate, time-consuming wind-ups of other styles. 4. Isshinryu is the most sensible form of Karate, with snap-punch and snap-kick techniques that permit you to move in and out quickly without committing yourself to a disadvantaged position, should you miss or misjudge. 5. Isshinryu is more adaptable to the American physique and temperament than other more rigid styles because the Okinawan Master designed it to follow natural body movements. The emblem is called MIZU-GAMI. It's oval shape originally was designed to represent a vertical fist. The orange ring around the patch represents a ring of fire, fire being a symbol of evil, aggressive forces and destruction. It shows Mizu-Gami, the Shinto Water Goddess, who is half sea-dragon, with her left hand open in a universal sign of peace and her right hand closed in a fist. In oriental mythology the Sea serpent is born at the bottom of the sea and ascends to the heavens as depicted by the small dragon above her head. The dragon has long been a symbol of good fortune in the Eastern Mythology. It also symbolized the Karate student, born at the bottom of the sea, so to speak, cleansed as he ascends through the ocean, and striving for perfection as he matures and learns. To Shimabuku water took on an image of purity, that cleansing force and vital substance without which there is no life. The churning sea and gray background represents a Typhoon, a terrible storm, that happens in the Pacific. Mizu-Gami represents a mother taking care of her small child, calm and gentle as a mother would be under these circumstances but ready to unleash the same amount of fury a mother would if the child was harmed in any way. The three stars represent the three arrows of Karate, Spiritual, Physical and Mental and have also been said to represent Shimabuku?s three instructors. Chojun Miyagi (Goju-Ryu), Chotoku Kyan (Shorin-Ryu), and Choki Motobu (Shorin-Ryu). The position of the stars is significant also; they stand in the heavens representing the highest of all possible perfection - a state Shimabuku felt his teachers had achieved and also something that is possible, given determination, perseverance and a true heart, for any Karate-Ka to achieve. In essence, the emblem depicts the elemental forces of life. There is peace represented by the open hand, power in the closed fist, evil in the flame, purity in the cleansing waters, the equalizing force of the Mizu-Gami, perfection in the heavens, and finally the Karate student who must encounter and assimilate the importance of all these things if he is to gain that ultimate perfection. The patch represents a vision, which came to Tatsuo Shimabuku in a dream during the time he was developing Isshinryu and was designed by a marine.